The Japanese game Hagoita is played with a battledore, or paddle and a shuttlecock, or birdie. It is a game played at New Year's and while it is enjoyed as a game, it is also traditionally thought to be a talisman against evil. People pray for good health for the coming year and playing Hagoita is believed to protect people from epidemics caused by insects like flies and mosquitoes because the flying shuttlecock looks like a dragonfly, which eats these pests. 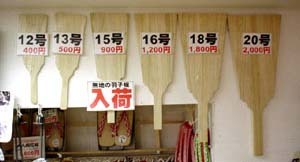 In the past people enjoyed decorating plain Hagoita paddles with paper, cloth or artwork. Recently these rackets are decorated on one side with a picture of a kabuki actor. These are now popular in Japan, and beautiful. My shop's specialty is the Plain Battledore, or, Plain (Undecorated) Paddle. Iwate Prefecture of Japan grows many Paulownia trees used to make the battledore, or paddle, used in the Japanese game: "Hagoita". The Paulownia of Iwate is used for the famous brand name "Nanbu-giri" which is exported all over Japan. My shop produces these original, plain paddles made of this Paulownia. These can be decorated with pictures, beautiful cloth, or colorful paper. Use your imagination. These are also used as a "postcard" and sent in the mail to friends or family. You can write on them, affix a stamp, and mail it. To use these in the game, Hagoita, which is similar to badminton, you need the shuttlecocks, or "birdies" made with soapberries in the traditional style. You can buy these from our homepage, or shop in Morioka. Buy them in bulk and save! These shuttlecocks are made very well and are a high-quality shuttlecock. The end ball of the shuttlecock that the racket hits is made from a MUKUROJI tree, seed-pod. This is very interesting. They have been made this way for along time. This is a slow-speed, short-distance flying style shuttlecock. These have a variety of ways in which they fly, and fall, and can be a lot of fun. When the shuttlecocks are open they are very pretty and many times are used just for display. This is a higher-speed shuttlecock but is still slower than the hane-tyuu-yanagi-3 style. This is a moderate-speed shuttlecock. It goes a little slower but it also goes farther. Itﾕs bigger so itﾕs easier to hit. Itﾕs enjoyable for beginners to advanced players. This is my Shopﾕs recommendation. This is a really high-speed and exciting shuttlecock. It is for the advanced player or the player who wants more challenge. This is a high-speed shuttlecock. It flies gracefully and is a very pretty sight. Because it is so pretty, many of my Shopﾕs customers like to get them for display or decoration around their home as well as for playing the game. About the MUKUROJI tree, seed-pod. The shuttlecocksﾕ ball is made from a MUKUROJI tree. 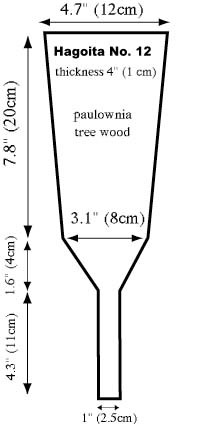 The MUKUROJI Family is a type of tree that is deciduous and grows very tall, up to about 15 meters, or almost 50 feet. These trees have small, light green flowers in the summer. When the flowers die, small fruits, or seed-pods, begin to grow. These fruits become hard, black and about 2cm in diameter. It is this, hard, black, stone-like fruit that is used to make the ball of the shuttlecocks. The bark of these trees can also be used as a soap substitute. 1. Please e-mail me at : jojo@karankoron.com, and tell me what you want. 2. We confirm your order and let you know the total cost. 3. If you agree with the amounts, please go to the following page and press the price button. 4. We will ship your order as soon as your credit card company authorize your transaction. 5. Your prarcel will reach you as for EMS within a week, as for Airmail in around ten days. What would be good size of hagoita for beginners? I recommend the following size for beginners. These hagoita are made of Paulownia Tree wood. Which hane would you recommend for beginners? I recommend 3 or 2 for beginneres. If you have any futher questions, please e-m@il me. Copyright (C) 2004 Akai-hanao-no-jojo. All Rights Reserved.